As I said before - in one of the last close-to release builds none of the vehicles had body64/bodyb64 textures. Maybe R* thought they looked better that way for a while. Aztecas_5 (now JohnnyK) will back me up on this. Sorry, I missed your previous post . That's interesting though. It certainly makes the vehicles look more "cartoonish," which kind of goes against the grain of the dark atmosphere of the game. After comparing the screenshots by thehambone, I assume your theory is right. I wonder if this text slide effect is still present in the code, albeit hidden. Never had a chance to take a look. It might be disabled just like one SA HUD feature which fades out elements after a while (like in IV+, kinda). Also confirms black bumpers on Banshee. Extremely unlikely. They were probably working on the textures, and weren't developed enough to be presentable just yet. 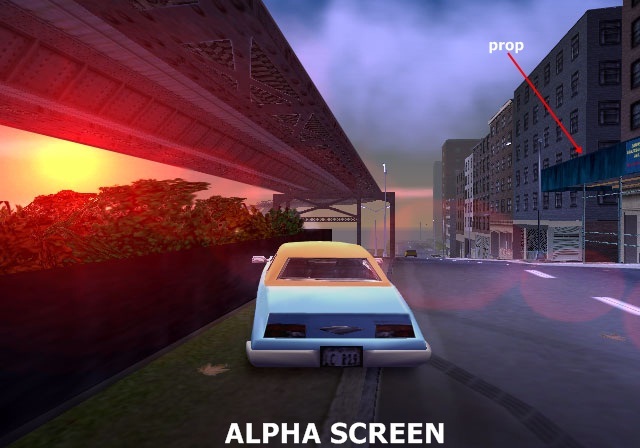 Not to come off as rude or anything, but it baffles me when people seem to think that Rockstar initially intended for flat color, almost cartoony, minimal body textures on their vehicles while elements such as headlights, tail lights and license plates all had higher quality, more realistic looking textures. Rockstar, and anybody for that matter should know better than to conflict two styles on the same object so dramatically. Look how close to release this build is. 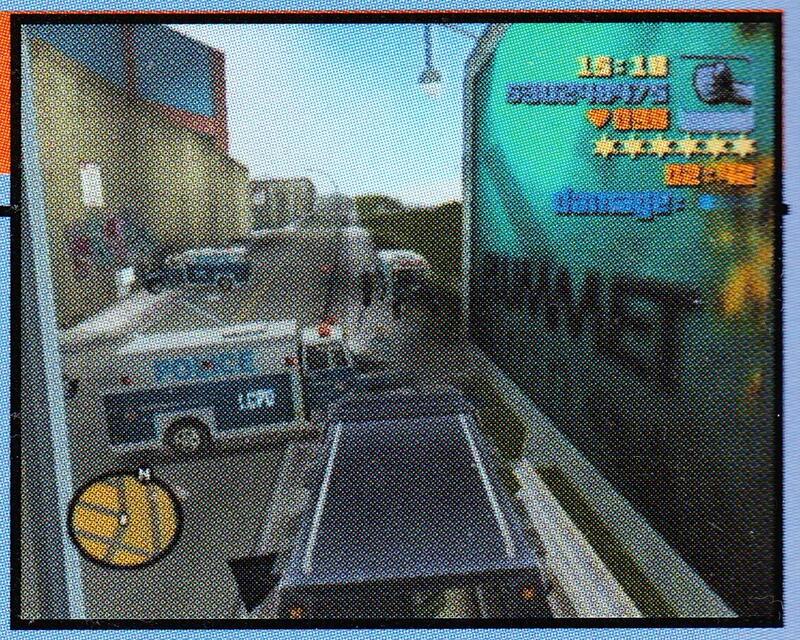 I remember seeing a screen of "Give Me Liberty" dated August 2001 iirc and it showed a purple Sentinel minus the body64/body64 textures textures on the bridge. Going to try to find it. Great, all I can find are reposts on fan sites, not the original source image on IGN/Gamespot/whatever, so I can't get a date on that image. Bullsh*t.
Interestingly enough, I did find this however. They were either still a WIP or R* was experimenting with them, since the Cabbie clearly has body64/bodyb textures and the Idahos in the BG don't. 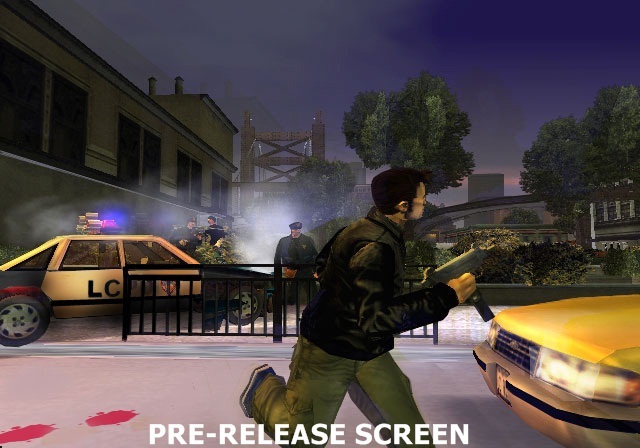 Alas, the original image no longer exists on IGN (only a thumbnail on an article dated 2002, of all things) so I can't get a proper date on it. Nice Silent, I forgot that video clips since the first time I saw them. Also that video clips is uploaded in Gouranga too. They were either still a WIP or R* was experimenting with them, since the Cabbie clearly has body64/bodyb textures and the Idahos in the BG don't. Regardless of the video, I still find it extremely unlikely they intended for the vehicles to look like that. Especially when the headlight and tail light textures were already complete. Further evidenced when you consider that textures from a video game development standpoint often tend to be a low priority when compared to other things such as programming, bug testing, etc. Considering all the other assets of the game having a dark and gritty appearance, it only makes sense. It however makes very little sense to have the body of the vehicle a flat color with no texturing, while the rest of the vehicle's elements get a realistic, high quality texture. Of course, we probably won't ever know unless someone who worked on the game speaks out, but until then I firmly believe that the body textures were a placeholder. 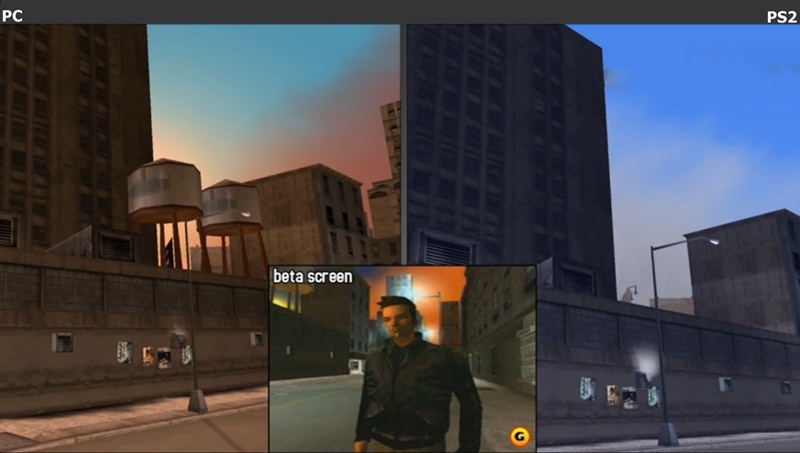 The clashing of the realistic and the cartoony styles on a single object is a very unfitting design choice for the atmosphere that GTA 3 carried. Precisely, you'd have to get a hold of Paul Kurowski (lead vehicle designer) or whoever modeled the vehicles for PS2/PC. I can only find the name of the guy who did the XBOX version models. How do you remove the body64's from each vehicles .txd? 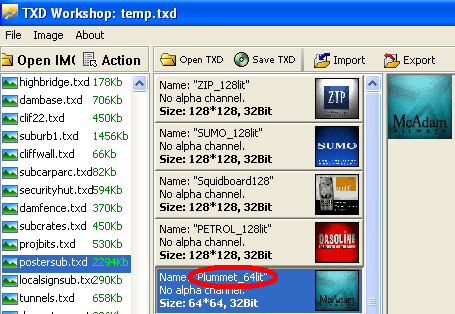 I'm using txd workshop. Any news regarding capital autos? BONUS: If you look closely to the police car, you can notice the photoshop. From those clues, I can assume that it was removed at late development stages. 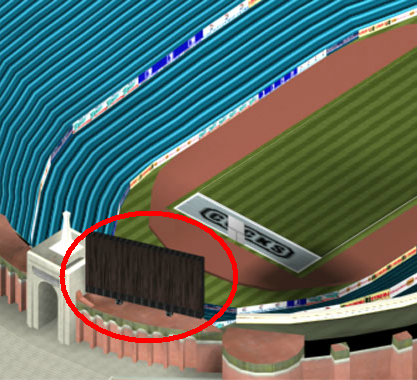 Nevertheless, this find further proves that stadium was meant to be accessible. One dude from another forum noticed, that the billboard on your right is different. 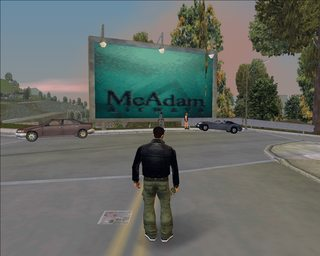 In the final version it is McAdam Airlines and in the guide it is Hummet or Rummet. Edited August 1, 2015 by Vadim M.
Looks like Plummet to me. Same, probably took it out due to 9/11. Definitely Plummet. It would've been one of those 'minor changes' that Rockstar did post-9/11. Around that time, most jokes and/or implications relating to a plane disaster were removed from various forms of media due to 9/11, so it only makes sense! 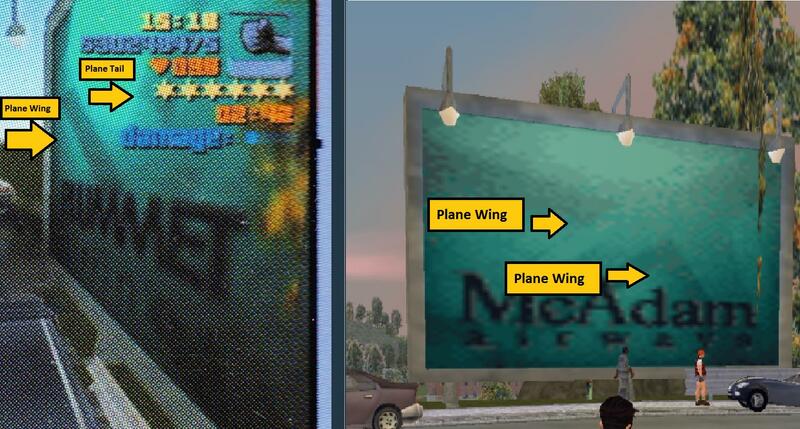 Also, compare the beta billboard to the current. You'll see that the position / orientation of the plane is different. In the 'Plummet' billboard, it seems to be facing the ground as if it was quite literally 'plummeting' towards earth, but in the modern billboard it's facing up, as if it's taking off. Definitely interesting! Now that that billboard has been brought up, when I was younger, I remember reading the guide and it mentioning something along the lines of "...near the Plummet billboard," and I always thought, "Wait a minute, that's not a Plummet billboard!" 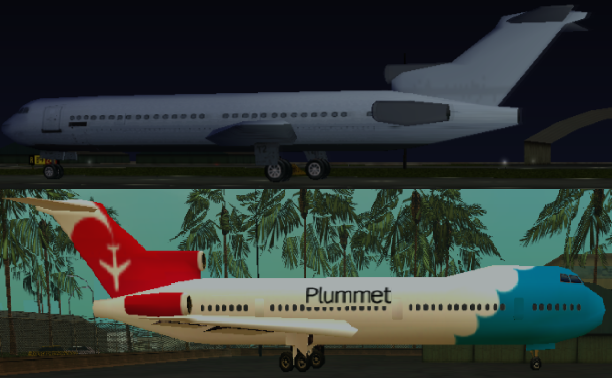 This, coupled with the "Plummet" remark at this wiki page, further proves that McAdam Airways was indeed called Plummet Airways in beta, indicating a last-minute change. Based on these clues, as well as previously-posted ones, I think that this case is solved. Aw yeah, I was right then.